Jackpot Mobile Casino is a dedicated mobile casino brand by Nektan. Don’t be confused this is not a casino with high jackpots, it’s just a very good mobile casino. If you’re looking for an excellent mobile casino which has a wide range of games then this is the casino for you. The games and promotions are excellent and well worth trying. Just be cautious with Nektan casinos as they do have a reputation of confusing T&C’s. Who doesn’t love jackpots? They give us the opportunity to win mega prizes with a single spin and have made more than a few people millionaires. Well, Jackpot Mobile Casino certainly tries to capitalize on this, bringing jackpots and playing on the go together. Established in 2015, Jackpot Mobile Casino is (obviously) a mobile online casino and part of the Nektan network. As a mobile casino, you can expect it to work great on iOS and Android devices. We had no issues during the review and we believe you’ll have none as well. What you’ll have is a lot of fun thanks to Jackpot Mobile Casino’s great game library filled to the brim with slots and of course, jackpots. Registering at Jackpot Mobile Casino will give you a whopping £500 bonus and 50 spins on the Starburst slot. The minimum deposit that qualifies for the bonus is £10, with the prize spread across your first 3 deposits. With wagering requirements of 40x, it’s not exactly on the fair side of things, but if you put in some elbow grease, you can win a nice sum of coins. The free spins are only available on the popular Starburst slot. The bonus’ maximum conversion is set at 4x from the bonus awarded. Although the name might imply a casino completely focused on jackpots, it’s not so. Jackpot Mobile does have a full library of slots, though, all provided by industry giants such as Microgaming and NetEnt, as well as in-house software (Nektan). You can expect a variety of slots and jackpots as well as more than a few table and card games and a complete live casino. With hundreds of slots in the game lobby, you can play all the exciting titles you’ve been hearing about and more than a few classics as well. Just visit the Player Favourites tab or click on New Games. You’ll get nothing but the hottest slots in the industry right now, and trust us, the choices are vast. If you’re not a spinner, head for the casino game section. There you can enjoy numerous variants of poker, baccarat, blackjack, and roulette. The live casino section shouldn’t be missed as well. All of Evolution Gaming’s hits such as Dream Catcher can be found here, so make sure to check it out. You can deposit and withdraw with a variety of payment methods. The casino accepts Visa, MasterCard, PayPal, Neteller, Skrill, Trustly, Paysafe Card, and even mobile payment options such as Boku. When it comes to Boku, there’s a 15% fee assigned to any deposit. There’s no charge for using any other deposit method. The maximum amount you can withdraw per day is £2,000. Players are allowed only one withdrawal per day. The customer support service at Jackpot Mobile Casino can be described as excellent. Apart from an extensive FAQ page, you can also contact the customer support team via e-mail or telephone. Of course, you also get live chat, which is unfortunately not available 24/7 (8:00-00:00 GMT). Sign up to Jackpot Mobile Casino today and claim 10 free spins on sign up. To claim these free spins all you need to do is sign up, you don’t need to deposit any money ! 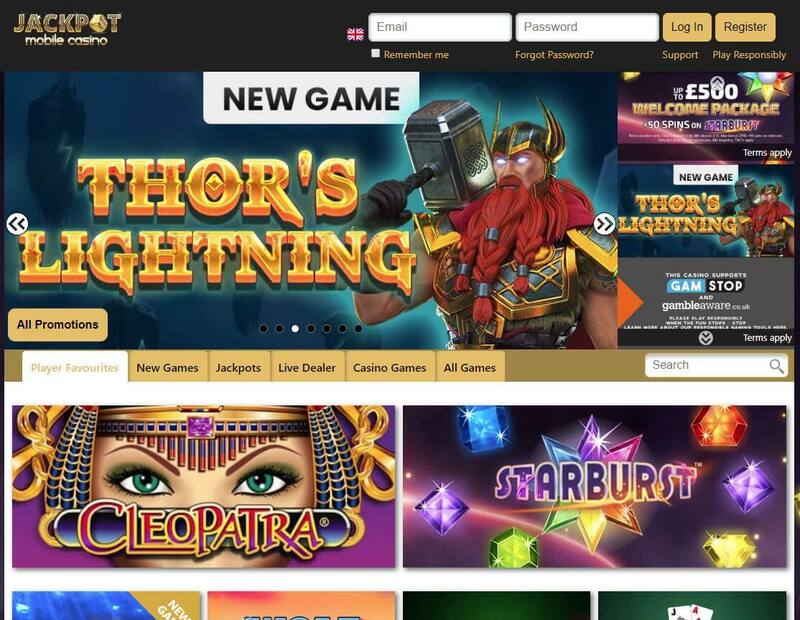 Once you sign up you’ll be awarded 10 free spins to use on the popular NetEnt Starburst slot game. Once you have used the no deposit free spins you can then claim a welcome package of up to £500 and 50 slot spins. The welcome package is split between your first 3 deposits. The First Deposit bonus is a 200% match up to £50 + 50 spins on Starburst. The minimum deposit for each bonus is £10. After your first deposit of at least £10, 50 spins will be added to your account and the spins will be worth 10p and valid on Starburst. The wager requirements on the bonus money is set at 40x. As you’ve probably already guessed from the name of this online casino, Jackpot Mobile Casino was made specifically with mobile players in mind. However, that’s not to say that other platforms aren’t supported as you can also play at the site using a desktop or laptop. Like other Nektan brands, Jackpot Mobile Casino doesn’t have its own mobile apps for Android and iOs devices on the Google Play and iTunes stores. As the website uses HTML5 web technology, you can simply use your device’s web browser to enjoy all of the games in instant-play mode. Provided that you own a modern smartphone or tablet that has a relatively fast internet connection and a web browser, you should have no issues playing at Jackpot Mobile. If you want to know how to get started, we’re happy to give you a hand by recommending that you use the link on this page to sign up directly at the casino. The site’s online registration form takes you through each stage of the sign-up process, prompting you to enter personal details where required, and reminding you that there’s a welcome bonus waiting if you wish to accept it by making your first qualifying deposit. The first time that you visit the casino, you’re asked whether you wish to save the site to your homepage. This will add an icon for Jackpot Mobile to your mobile device’s screen so that you can launch it more quickly on future visits. The language settings at the top of the screen allow you to translate the site into a choice of different languages, including English, French, and German. Jackpot Mobile Casino is home to a gigantic array of games which can be loosely categorised by three genres – casino games, slots, and scratch cards. As a Nektan casino, Jackpot Mobile Casino works with multiple software vendors that range from globally-recognised brands to new companies, including Microgaming, NetEnt, Aristocrat, Barcrest, 2 by 2 Gaming, Yggdrasil, WMS, Thunderkick, WagerMill, Red Tiger Gaming, Rabcat, Quickspin, Realistic Games, NYX Interactive, NextGen Gaming, Merkur, Pragmatic Play, Lightning Box, Just for the Win, IGT, Foxium, and Eyecon. Let’s start by looking at the casino games on offer. There are both live and non-live games to choose from including plenty of video poker variants such as Aces & Eights, Double Double Bonus Poker, and Bonus Deuces Wild Poker. The live tables are hosted by both Evolution Gaming and NetEnt and, therefore, you can enjoy everything from Lightning Roulette and Football Studio to Live Auto Roulette and Live Blackjack. The non-live casino games include titles like Oasis Poker, Pontoon, Classic Roulette, Blackjack Low Limit, Punto Banco, European Roulette and Red Dog. Under the heading of “Slots”, you’ll find a wealth of options such as Champions of Rome, Scudamore’s Super Stakes, Shogun of Time, Witch of the West, Turn your Fortune, Book of Oz, Vikings, Halloween Jack, Legend of the Golden Monkey, Starburst, Vikings Go Berzerk, and Hold the Safe. The section marked “Scratch Cards” actually includes a whole lot more than just scratchers. For instance, there are casual games like Super Cash Buster, Tripoll, Colour Cubes, Lil’ Lady Bingo, Epic Gems, and Diamond Deal. The Help page, which can be accessed via the website’s main menu, includes a plethora of handy information. There’s a section which tells you all about the casino, a dedicated page which explains how you can handle your money, contact details, and FAQ. The FAQ covers most general queries such as how to register an account, mobile compatibility, deposit methods, fairness, and more. If you want to contact the customer service team directly, you can do so via telephone or email. Please note that telephone support is only available from 9 AM until midnight from Monday to Friday. Jackpot Mobile Casino offers its members an excellent selection of payment methods that make depositing and withdrawing funds a doddle. You can choose from Visa Debit, Visa Credit, Visa Electron, Maestro, MasterCard, Neteller, Skrill, Boku, Paypal, and Zimpler. The minimum amount that you’re allowed to deposit is £10, and the maximum is £2,500. However, if you’re using Boku (Pay by Mobile), you’re restricted to depositing £30 per transaction due to safety reasons and cannot withdraw to Boku. Jackpot Mobile Casino allows you to cash-out a minimum of £10 per transaction and up to £20,000 per week, and the withdrawal processing time is advertised as two to three working days. Jackpot Mobile Casino is a true mobile casino – but that’s nothing new. overall its an excellent casino. be sure to read and understand the T&C’s of this casino!